So my little munchkin turned 2 on Wednesday. Time has flown. For his first birthday I made his "I am 1" onesie too. It was cute. I used camo and turquoise and did a little sewing, with a little help from my best friend. 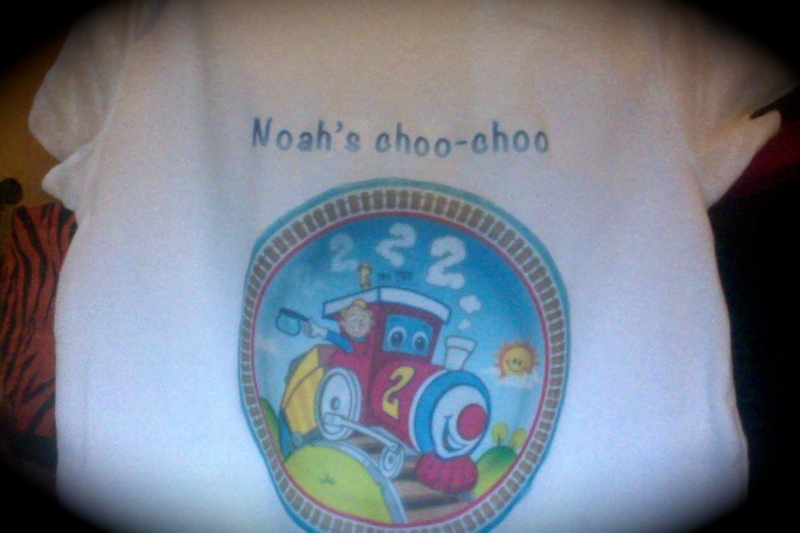 This year I had planned to do a TRAIN party and I wanted a cute shirt. Everything I found, on etsy, was more money then I wanted to spend. So... I decided to do it myself again. I had no clue how to make it the way I wanted. I talked to a few friends and read a few things online and decided just do a a transfer. I was shocked that I could actually just print something on my computer and then put it on the shirt. Don't laugh! I know this is something all of you have probably done before... but I have not! I was excited. So the first thing I did was find the picture that I wanted. I wanted something with '2' on it. 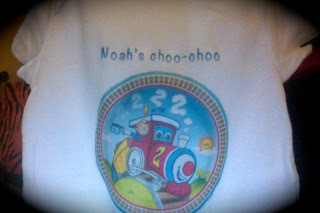 So I found the picture I wanted and typed up "Noah's chop-choo"
The problem I had was figuring out how to get it to print in reflection mode. There were only five sheets of print paper in the pack I had purchased. I kept doing something wrong. I finally figured out how to change my print to reflection mode on my MAC and on the 5th sheet it came out right. So I cute out the picture and words... I had already been told to cut close to the picture so the paper doesn't show up. Then I had to place the cut outs on the shirt where I wanted them. I had to check a few times to make sure that I had it straight... and then I ironed it on. I let the iron sit on each section for about 30 seconds and then continued to iron it a little longer.. I wanted to make sure it would stay. And it did!! This is the final product. It isn't EXACTLY what I was wanting for him. But it did the job. He liked it well enough... He is in love with choo-choo's so.. he loved the train on it. Now the problem I had and I am hoping someone can help me with it... he only wore it for like two hours. Half of the train started peeling off. Has anyone ever done this? Do you know why it did this? Do you know what I could have done differently? Help?